Today’s post is for pure #101 travelers–those of us who fly a few times a year to a few different places and just want their tickets to be paid for with miles whenever possible. I wanted to pick the easiest program to get started collecting Miles in. 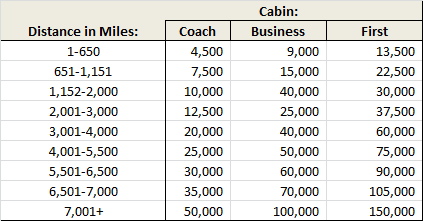 Today I’ll introduce the process I used to come to my decision, and ask those of you who are new to using miles to try out the program yourself. In doing so I’ll also go step by step through the booking process and discuss how much savings you can expect using the program. Unfortunately, when you’re trying to take things to the limit and push for as much return on your investment in miles as possible things can look difficult to a beginner. While there are plenty of great ideas thrown around here on the blog, even I have to admit; a lot of them are pretty complex. Today we’ll take it back to the start–and really try to simplify things. Southwest(WN) probably has the easiest redemption–you find a flight, and book it. Every flight with paid fares available books with WN RR points. Unfortunately a program like Southwest doesn’t expose us to the true nuances of booking with Miles. I want to disqualify Southwest for the purpose of this post because it was really just a fixed value point system, crediting you for the cost of the flight. What makes WN rapid reward points different from capital one miles? or US bank Flexperks? Nothing–except that they’re only useful for flights on Southwest. Lets agree to disqualify Southwest on these grounds. Note: There’s nothing inherently wrong with these types of points. Milenomics loves WN RR points–and also has started to really like Virgin America Elevate points. Finding what works for you is the most important thing you should do. If your strategy–especiall as a #101 is to fly Southwest, go for it. “Traditional” Frequent Flyer programs do things differently. The points hold no real value until you redeem them. Redemptions are done against an award chart which lists the cost for each type of flight, either based on zones, countries, or distances. In addition (unlike Southwest, or other fixed value points), your choice of flights is limited. The benefits of these types of programs is that the number of miles does not depend on the cost of the flight–but on the origin and destination. What we try to do is find those flights of ours that are pricey–and then book them with as little points as possible. United: Sets the standard for how an award engine should work. Even complicated open jaw and stopovers can be booked online with this engine. However for domestic flights I don’t recommend (yet) using United Miles. US Airways: Absolutely horrible online engine–no one way awards. With a few months until the merger goes through I can hardley recommend anyone use the terrible US engine for booking. Also impossible to do a 1 way booking–which results in having to resort to these kinds of Milenomics tips to book a 1 way. American Airlines: AA’s award engine is very easy to use–and can show many partner awards as well. I disqualified it because almost always results in spending more (and more valuable) miles than a booking with BA Avios. 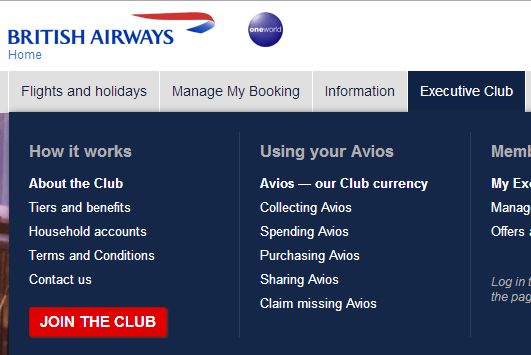 British Airways Avios: Unfortunately cannot be used to book all possible partners online, most notably Alaska (AS). However because it can offer rock bottom pricing, and books AA awards online I argue it is our winner. BA Avios Are the #1 Program to Start Out With. 1. Miles are easy to earn (being a MR transfer parter, a UR transfer partner, as well as having a co-branded card from Chase). 2. You can pool miles using the transfer option of UR/MR or by setting up a BA Executive club household account. This means no more orphaned miles. 3. In addition there are usually bonuses; currently 1,000 MR transfer into 1,200 Avios. The Chase BA card earns 1.25 Avios per $1 spent–a premium most other cards don’t match. 4. The booking engine is powerful–powerful enough that I recommend it for AA and oneworld international searches. So anything learned by using the engine will be useful for future booking. 5. Bookings can be done for as little as 4,500 Avios one way. With pricing that low collecting and using BA Avios can happen very early into a mile collecting career. 6. Book AA flights for less miles than with AAdvantage miles (with some bonus BYOE benefits). That’s all there is to it. No zones–no difference in cost between flying on BA, AA, AS, or any other alliance member or partner airline. The best way to get started is to just jump in and book something with your BA Avios. If you’ve never booked a flight with miles before, bookmark this page–and once you’re ready to do so take your Demand schedule, and find a flight from your home airport within 650 miles. With Airline route mapper this can be done by going to View–>Options and then limiting the route length to under 650 miles. 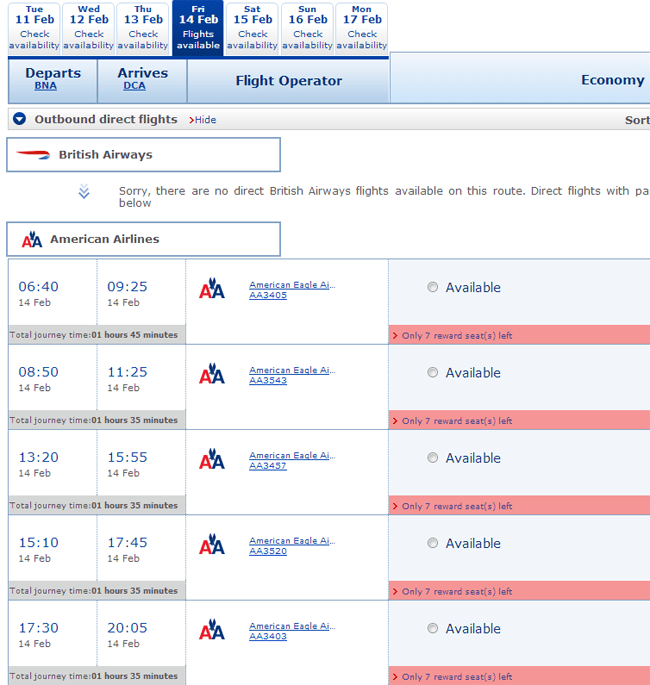 Now that you have a look at what flights are under 650 miles make sure that AA serves the airport of that flight. 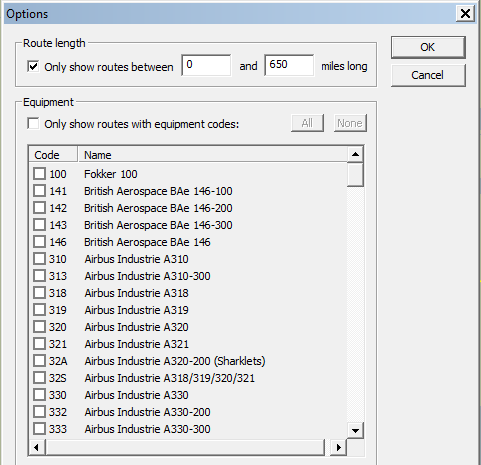 Restrict Airline Route Mapper to AA only, and load the map. 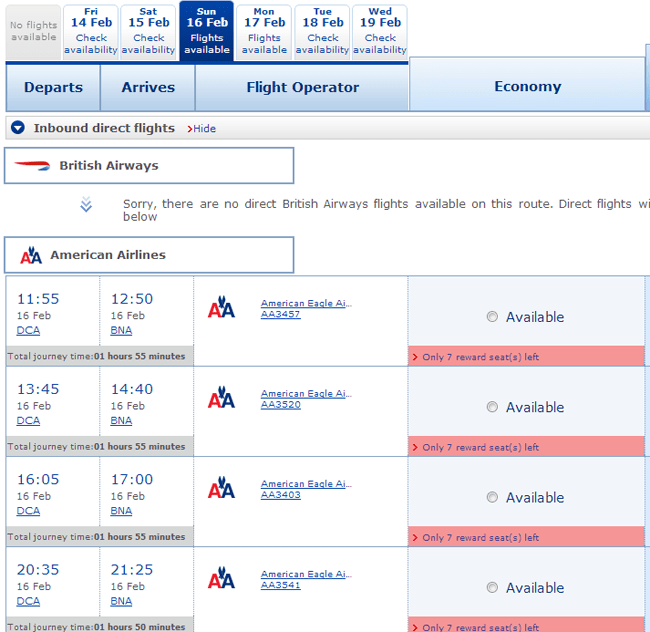 You can also look up AA route maps here. Prices from ITA Matrix–a wonderful search engine for pricing out paid tickets. $397 per person for under 2 hours of flying is pretty steep. Lets look for award flights for the same weekend. As I mentioned long ago in the post “the best way to search for low level awards,” Often times the best way to search for awards is not with the program you’re booking with. When booking AA, or Delta I recommend using the Alaska Airlines search engine found at www.alaskaair.com. Don’t pay attention to the number of miles (12.5k)–this represents the miles you would need to book this with Alaska Miles–with Avios we go by distance, with our 590 mile flight we pay just 4,500 miles. We also do not pay the $15 each way. Write down the flight number you like the most, as we’ll use it when we go to book. You can’t book flights with Avios from this screen, we are only using Alaska’s search engine to search for flights. Note: With Avios you almost always want to look for non-stop flights only. This is because if you include a stop you pay the mileage for each segment–which could double the miles needed. In this example there are plenty of good nonstop flights, so we look ready to book. A rule you’ll want to remember for booking is that you always book with the program who’s miles you hold, not the program of the plane you’ll be flying on. So in this case even though you’re flying on AA–we’re booking with BA Avios– so we need to do the booking with British Airways. We didn’t do the search with BA, but with Alaska because they have an excellent calendar that shows a month at a time. 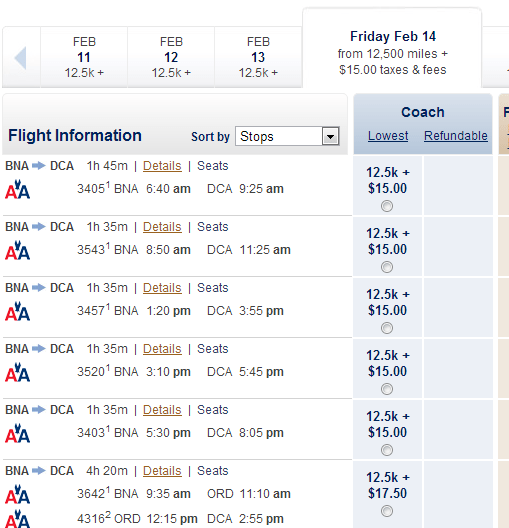 All three, AA, AS, and BA have the ability to book on each other. These types of alliances and partnerships are what confuse first time Mile users, and also allow airlines to commit robberies. You’ll have to have previously signed up for a BA Executive Club (Avios) account either to transfer miles in from MR or UR, or as part of signing up for the BA Visa. If for some reason you have not done so–sign up for an account now. You’ll sign up here. In addition you’ll want to make sure to write down your BA Executive Club Number somewhere safe. After signing up, and transferring in the miles you need (Call MR/UR for help transferring if you need it) go ahead and log in, and we’ll start our booking. Input your cities, BNA and DCA–and the dates from our earlier Search on Alaskaair.com: 2/14 and 2/16, 2 passengers, and finally, make sure you select “Economy” and click search. Make sure you select “book with Avios” and Economy for the Class of travel. Select your number of passengers and click find flights. Compare these flights to the ones found searching Alaskaair.com. You’ll see the flight numbers are the same. Partners have access to the same seats. Once we book ours the available seats to either Alaska, American, or British Airways bookings will go down by that many. Once you’ve completed this first booking hopefully you’ve learned a few things about the mechanics. Future bookings won’t be as intimidating. Eventually you’ll start to prefer award bookings over cash bookings–and then you’ll be a full fledged Milenomic. I know it seems strange–a Company based in the UK, with a relatively unknown mileage currency which has bookings that are not handled like most other programs ends up being the top program for US domestic travelers on AA and AS? That’s just an example of how miles work. They don’t often make sense to us because we’ve spent a lifetime buying tickets the old way–based on price and from a website that allows us to shop for all kinds of flights. While spending miles is a little harder, you can’t argue with the results: the above booking was $794 for 2 passengers. Instead we used 18,000 avios and $10. This translates into a 4.4 Cent Per Mile redemption. While this is a fantastic value–don’t chase these high value redemptions and pay for lesser ones–try instead to earn enough miles to pay for all your flights with miles–a little something I like to call EQM-Zero. If you’re a true #101 Milenomic and fly just a few flights a year you should be able to do so without too much trouble. With miles the simplest solution is often the worst possible one. Calling AA and booking the same flight with AAdvantage Miles would have cost us 50,000 AA miles for the two seats. We saved $784 and 32,000 miles by booking with Avios instead of AA miles (or cash). The usefulness of BA Avios in other situations (international, premium cabins to/from Europe) can be low. Miles are usually good for certain travel, and horrible for others. Instead use these easy to earn, easy to spend miles to travel around the country for less. Great overview. Wish I had such a well presented post to read when I was first trying to figure things out. And yes, I agree with you about BA for domestic. Really hard to beat. They are also useful for positioning flights internationally where there are low fuel surcharges. Bravo. Very good post, very convincing. Will point noob friends to this one! As someone who has been overwhelmed with trying to learn this game, I very much appreciated your step-by-step explanation here. Thanks so much!